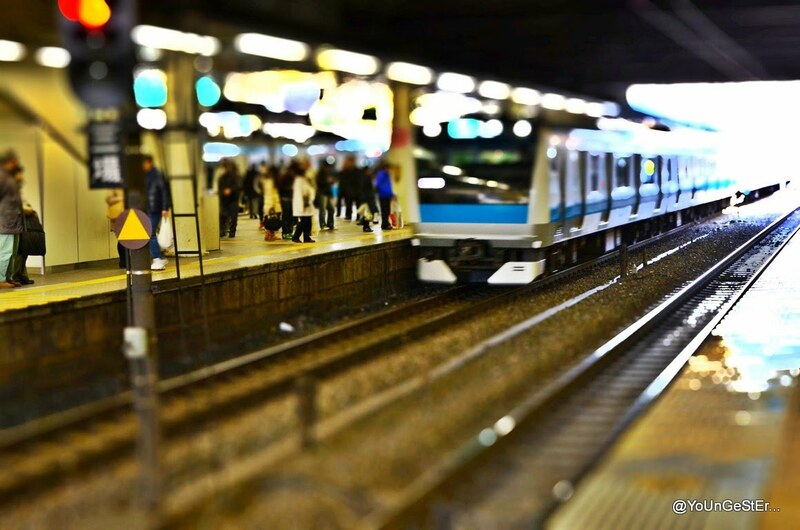 Tokyo Walk : Started from Kawasaki riding train going Tokyo at 12:00. Seeing Imperial palace , House of representative building then Ginza Street. At night around 20:30 went to Ebius to attend marriage party of my Japanese teacher and later home around 23:00. Waiting at Kawasaki Station to ride train going Tokyo Station. It takes around 20 mins by Tokaido Line. Inside train Tokaido Train : A girl with GAP shopping bag scrolling her IPhone. Huge Tokyo Station : Tokyo Station (東京駅; -eki) is a train station located in the Marunouchi business district of Tokyo, near the Imperial Palace grounds and the Ginza commercial district. You can find the exact location of Tokyo Station on our Tokyo Map. It is the starting point and terminus for most of Japan's Shinkansen lines and is also served by many local and regional commuter lines. Unusually for a major Japanese station it is not linked to any private (i.e. non-JR) railway lines. Inside Tokyo Station : Lots of People , Lots of Malls. tokyo Station (東京駅; -eki) is a train station located in the Marunouchi business district of Tokyo, near the Imperial Palace grounds and the Ginza commercial district. You can find the exact location of Tokyo Station on our Tokyo Map. It is the starting point and terminus for most of Japan's Shinkansen lines and is also served by many local and regional commuter lines. Unusually for a major Japanese station it is not linked to any private (i.e. non-JR) railway lines. Tourists with there Kids and lots of baggage at Tokyo Station. The main station facade on the western side of the station is brick-built and was fashioned after Amsterdam's main station. The main station consists of 10 platforms, serving 20 tracks, raised above street level running in a north-south direction. The main concourse runs east-west below the platforms. 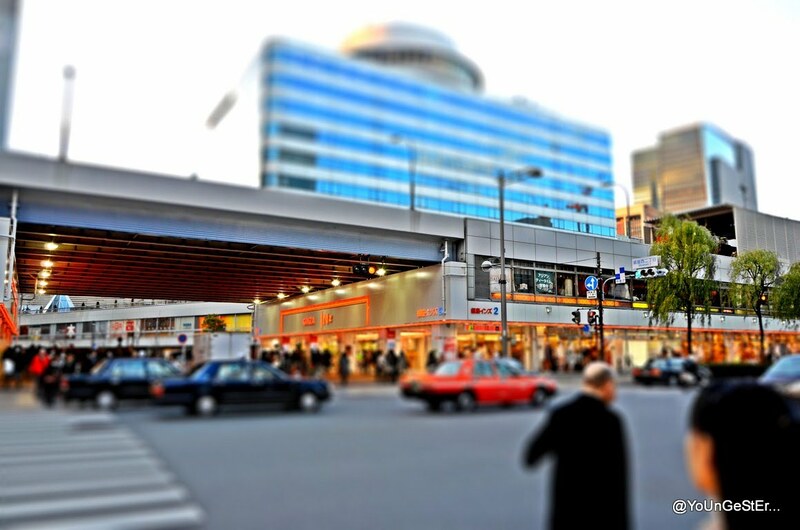 The Shinkansen lines are on the east side of the station, along with a multi-story Daimaru department store. Underground are the two Sōbu / Yokosuka line platforms serving four tracks (five stories below ground level) to the west of the station; the two Keiyō line platforms serving four tracks are four stories below ground some hundreds of meters to the south of the main station with moving sidewalks to serve connecting passengers. 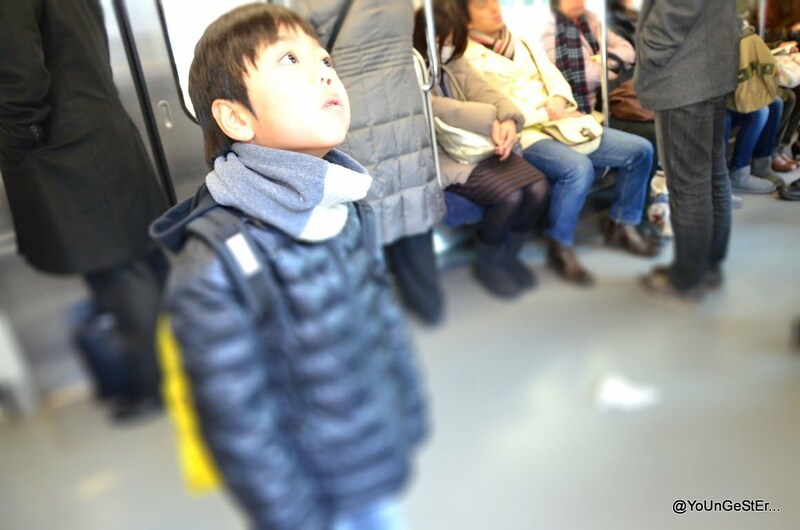 The Keiyō line serves passengers going to Tokyo Disneyland and Makuhari Messe. Get out from Marunouchi Gate and walk towards Imperial Palace in between huge building. Outside Tokyo Station going towards Imperial Palace. Straight is Imperial palace. The current Imperial Palace (皇居, Kōkyo) is located on the former site of Edo Castle, a large park area surrounded by moats and massive stone walls in the center of Tokyo, a short walk from Tokyo Station. It is the residence of Japan's Imperial Family. Edo Castle used to be the seat of the Tokugawa shogun who ruled Japan from 1603 until 1867. In 1868, the shogunate was overthrown, and the country's capital and Imperial Residence were moved from Kyoto to Tokyo. In 1888 construction of a new Imperial Palace was completed. The palace was once destroyed during World War Two, and rebuilt in the same style, afterwards. The Gate inside we cannot enter except January 2 (New Year's Greeting) and December 23 (Emperor's Birthday). MAI - Meet her first time . Accompanied on tokyo walk. First I though its snow floating but looking carefully find out its Swan doing fishing. Sunday there are lot of people practicing for marathon here. They run around the palace. Around 400 or more people run. The main house of the Japanese Congress and the main administrative and political center of Japan. 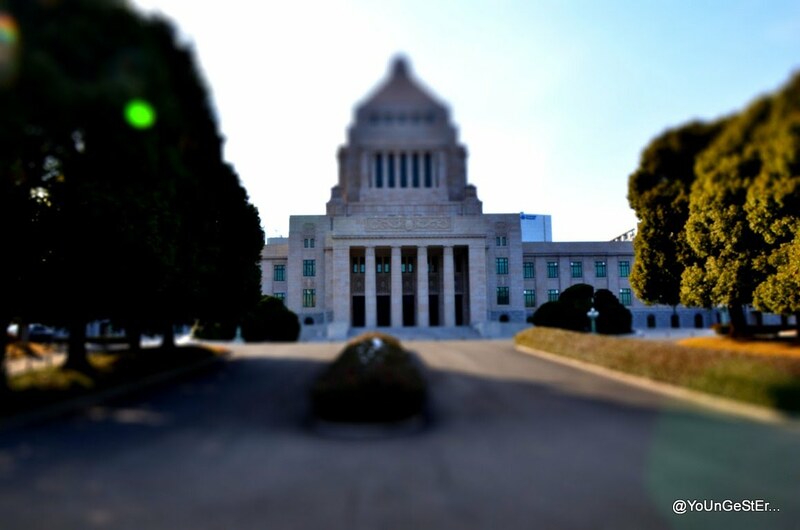 Japan is a monarchy/ parliamentary system where the emperor is the head of state but actual political power is exercised by the prime minister who has offices here in the Diet Building. The Diet Building was completed in 1936 and is constructed entirely out of Japanese building materials. the building is divided into the house of councilors and the house of representatives. Just across the road from Nagata-cho Station (Yurakucho subway line). Walking Back to Tokyo to find restaurant to find some food. Korean Restaurant near Kanda Station . It is build under JR lines. Spicy Korean Food : Its like ramen where you add rice. Its a big bowl with 1000 Yen only. Nice Tasty food. Giza Street : The Ginza (銀座) is Tokyo's most famous upmarket shopping, dining and entertainment district, featuring numerous department stores, boutiques, art galleries, restaurants, night clubs and cafes. Ginza Street : One square meter of land in the district's center is worth over ten million yen, making it one of the most expensive real estate in Japan. It is where you can find the infamous $10 cups of coffee and where virtually every leading brand name in fashion and cosmetics has a presence. 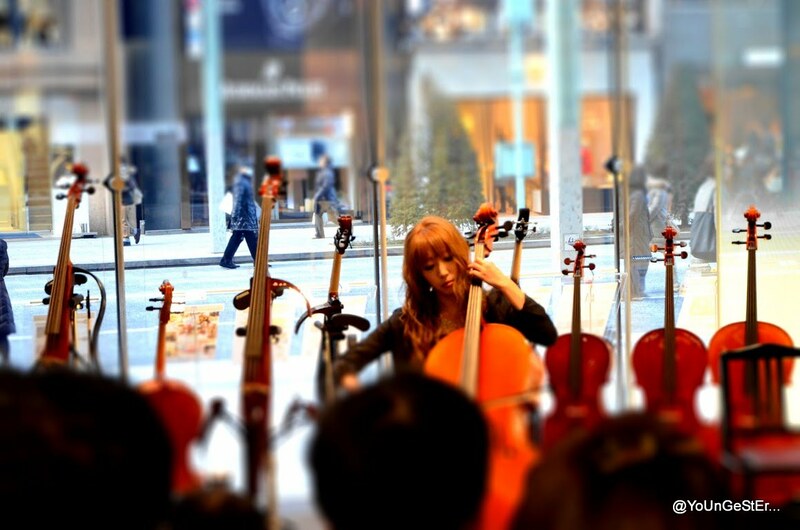 Yamaha is Japan’s leading general musical instrument manufacturer, and creates a very wide range of classical music instruments to modern electrical instruments. To express the essence of Yamaha’s brand and materialize its architectural design at Ginza, in which a number of worldly-famous brand shops are gathered, the basic themes of this architecture are set out to be “a building that exudes the feel of sound and music” and “the union of tradition and innovation”. To achieve the building’s concept image, which is a woodwind instrument that is placed inside a glass showcase, the connected three atrium spaces facing the streets are finished with wooden materials of curved molding that reminds the woodwind instruments. The façade of the building is composed of the diagonal grid expressing the fluidity of music, and the differently tinted sheets of gold-leaf laminated glass scattered in a random pattern expressing the brass instruments. With this façade, a number of musical senses are tried to be expressed in this architecture: a sparkling and shifting sense of sound, a rhythm, and a sense of constant change and transformation through time, which is reminiscent of an Impressionist painting. Gold-leaf laminated glasses are newly developed by sandwiching Japanese traditional craftsman’s gold dust between high-translucency glasses using modern technologies. In addition to an image of brass instruments, it represents Japanese traditional image. By hanging these gold-leaf laminated glasses with the diagonal cable-grid system, a new type of curtain wall, which also could be said “a modern version of stained glass”, made it possible to see through from inside and outside. Chinese themed restaurant atop the Hyundai Department store in Cheonho, Tokyo. Rotates counterclockwise unlike most revolving restaurants. Japanese Teacher Wedding ( Hijikata ) : Meeting after 6 years first time in Ebius.